Check out the video preview below. 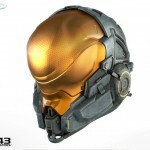 After the jump, you can see the photos of each helmet, as well as more info. 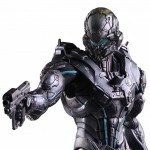 Back at San Diego Comic-Con 2015, the Square Enix Booth gave us a look at their upcoming Halo 5 Master Chief and Spartan Locke Play Arts Kai Figures. At the time, we only had unpainted prototypes to check out. Now Square Enix has sent out official photos and info for the upcoming figures. These newly sculpted figures are scheduled for release in April. They will be priced at 14,800 Yen each (about $125 USD). There’s no word on what accessories, other than the weapons pictured, will be included. We’ll update if and when new info is released. More images from the McFarlane Toys booth at this year’s New York Comic Con 2015! Check out images of upcoming Halo figures, statues, as well as new items from Assassin’s Creed including some deluxe role-play items! As well as a few figures from Assassin’s Creed including the role-play item the Hidden Blade Gauntlet!